If there is one artist in Wales and the UK whose artistic pursuit has, throughout his prolific life, centred on Flight, it is Denis Curry, who combines a “profound knowledge of nature’s engineering structure with poetic vision”. An exceptional draughtsman, painter and sculptor he has integrated aesthetics, aeronautics and natural sciences as processes in his work. After two years at Durham School of Architecture, Curry joined the Royal Engineers and saw active service in North Africa and Monte Casino. At the end of the war he went to the Slade School where teachers included William Coldstream (Principal), Reg Butler, Henry Moore, and Professor A. H. Gerrard. He won prizes for drawing and sculpture, including a 4th postgraduate year. 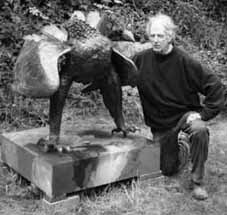 Denis Curry worked with Prof. Gerrard on many sculpture projects, designing and carving, including the summer house at Chartwell and the Onassis tomb at Highbury cemetery. After some years teaching in colleges and schools in and around London, he went to Exeter College of Art as Head of Sculpture. There he worked with Cliff Fishwick (Principal) and John Epstein to successfully win the Fine Art Degree for the college. He was then invited to join the staff of the West of England College of Art to help them gain the degree on their second try. Curry was then appointed as Head of Foundation Studies where he stayed for 16 years resigning to do his own sculpture and painting. His life’s work on a human-powered ornithopter is on-going and his research into bird/insect flight is often used in his sculpture and drawings. In 1967 he was granted the first patent for a variable-geometry ornithopter. A paper on the propulsion of an ornithopter by Curry was published by the R. Ae. Soc. in 1975, and was elected an Associate. He has exhibited at the Royal Academy; London Group; National Eisteddfod; Pelter/Sands Bristol; Richard Beere Cardiff; West Wales Arts Centre; Oriel Myrddin; Museum of Modern Art, Machynlleth etc. He exhibits regularly at the Royal Cambrian Academy to which he was invited to become a member by Kyffin Williams in 1992, also at Royal West of England Academy, where he was invited to become an honorary academician in 2008. The Contemporary Arts Society of Wales has bought his work in 1999 and in 2010. Tenby Museum and Art Gallery were successful in their bid for the loan of the 2 works (bronze and a drawing) purchased by CASW in 2010. He has completed large scale bronzes on commission of swans, eagles, and horses, etc. Denis Curry’s work also includes ‘The Human Powered Wing’, a variable-geometry ornithopter claimed to be the first such machine to initiate propulsion solely by means of the wing movements. Visit www.humanpoweredwing.co.uk to find out more.